I’m always looking for a new mountain to conquer! At 10,648 feet, Sunset Peak provides sweeping views in every direction. From its summit, you can marvel at the Brighton Lakes, Mount Timpanogos, Heber Valley, Big Cottonwood Canyon, and Little Cottonwood Canyon. The ascent is pleasant, not too steep and not too long. The hike to Sunset Peak is a must-do for those who want to experience the beauty of Utah’s mountains! 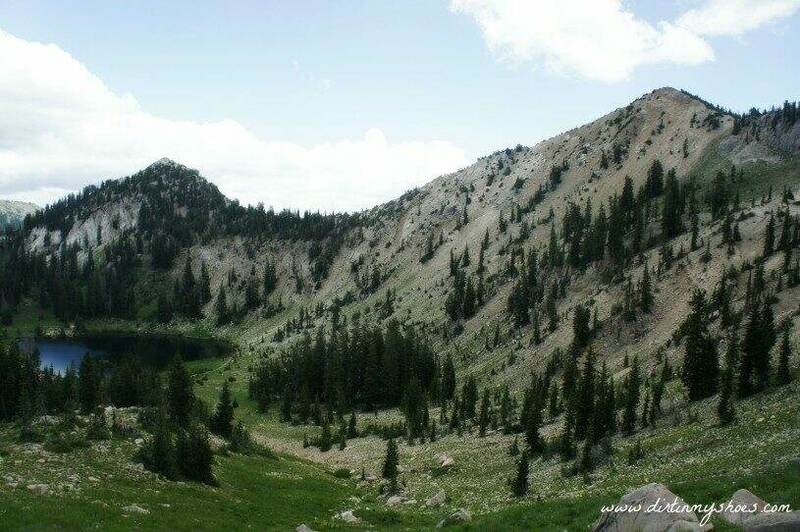 Sunset Peak can be reached from Big Cottonwood Canyon or Little Cottonwood Canyon. Both canyons are just minutes from Salt Lake City and are easily accessible. My favorite way to approach Sunset Peak is via the Catherine Pass Trail in Little Cottonwood Canyon. This trail is stunning as it meanders through the world-famous wildflower destination, Alta’s Albion Basin. Our hike was slow-going because I could not stop ooohing and awwwing over the flowers along the way. If you have been following along on my adventures, you know that I don’t like to see man-made structures while I hike. This is why I will always choose the Catherine Pass Trail in Little Cottonwood Canyon to access Sunset Peak. A ski lift can be seen for a few minutes at the beginning of the trail, but after that it is nothing but you, the mountains, and the flowers! I love seeing wildflowers along the trail. Try to hit this trail during peak wildflower season, usually early July through the middle of August. After hiking along the Catherine Pass Trail for a steady climb of 1.5 miles, you will reach Catherine Pass. This is a great place to stop for a picnic lunch as you gaze down at Lake Catherine below. From Catherine Pass, Sunset Peak can be seen to your right. The base of the mountain sits right beside the sparkling Lake Catherine and is mostly bald on the top. You will see several trails leading to the mountain, and you may even catch a glimpse of the tiny people standing on its peak. If you have opted to hike in from Brighton in Big Cottonwood Canyon, take the Brighton Lakes Trail and shortly before reaching Lake Catherine where the trail forks, stay to the right to head up to Catherine Pass. Both the Catherine Pass Trail from Alta and the Brighton Lakes Trail from Brighton converge at Catherine Pass. This is where the trail to the top of Sunset Peak begins. As you face Lake Catherine and Sunset Peak from the Pass, you will see a well-traveled trail on your right that begins to head up the ridgeline. This is the trail to reach the Sunset Peak Summit. The trail forks in a few spots, but I suggest always taking the trail that stays close to the ridgeline. You will encounter a few steep dropoffs momentarily along the trail, making this trail difficult and a little dangerous for young children. That being said, John did fine with Jackson on his back. Know your own limits! The trail can be sandy at times! The views from the top are amazing! Even though the temperature at Catherine Pass was comfortable, it was chilly and windy on top of Sunset Peak. If you plan to stay on the summit for a while, be sure to bring a jacket. The trail to the top of Sunset Peak from the Catherine Pass Trailhead via Little Cottonwood Canyon is 5 miles round trip. The trail from Brighton via the Brighton Lakes Trail in Big Cottonwood Canyon is 6 miles round trip and slightly more strenuous. Dogs are not allowed on either trail because both canyons are part of the Salt Lake City Watershed area. To take the Catherine Pass Trail in Little Cottonwood Canyon: From Salt Lake City, head east on I-215 and turn off at 6200 S, exit 6. Turn right onto Wasatch Boulevard and continue on this road for 9 miles. Turn left when you reach 9800 S (Little Cottonwood Road) to reach the mouth of Little Cottonwood Canyon. Travel up the canyon for approximately 8 miles to the Alta Ski Resort. From Alta, you may be asked to park in the parking lot and take a shuttle up to the trailhead. The Catherine Pass Trailhead is 2 miles past Alta along the summer-use dirt road. This road doesn’t open to cars until July 1 and has very limited parking. Plan some extra time in case you can’t find parking at the trailhead and have to wait for the shuttle. I strongly suggest hitting this hike mid-week to avoid some of the parking craziness! To take the Brighton Lakes Trail in Big Cottonwood Canyon: From Salt Lake City, take I-215 east and exit at 6200 South toward the ski resorts, exit 6 (don’t use the Exit Only lane). Take a right onto Wasatch Boulevard and travel south until you reach Fort Union Boulevard (7200 South). You will see signs for the Brighton and Solitude Ski Resorts, as well as Big Cottonwood Canyon. Turn left and head up the canyon until you get to the Brighton Ski Resort at the very top (about 14 miles). Have you hiked to the top of Sunset Peak? Do you have any questions about the trail? Let me know in the comments below! Thanks for that great guide! I live close to Little Cottonwood, but didn’t know about this hike. I also don’t like to see man made structures on hikes, so this was a great find! I pinned this! Thanks Helena! I absolutely loved this hike, and although it is a busy area, it isn’t one that you hear about very often. I would love to hear about your experience on my Facebook page after you complete the hike! gorgeous pictures! I haven’t done much hiking from little cottonwood as I like to hike with my dog (Utah watersheds make it hard! I have done the Brighton Lakes which were gorgeous! But I may have to ditch her so I can see that lake and all those wild flowers! Yeah, the watershed is a little limiting! I often wish that I could swim in the water after a long hike 🙂 But this trail is definitely worth it….it is incredible! !